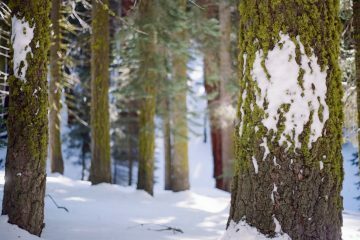 by Andy DappenOne wintertime beauty of having Highway 97 dissect a big slice of the Eastern Cascades near Blewett Pass is the enormous avalanche flexibility this terrain offers backcountry skiers, snowboarders, and snowshoers. It’s an extremely rare day, even when avalanche hazard is high at Stevens Pass or at Blewett Pass itself, that you can’t find safe peaks to climb and safe terrain to ski somewhere along this corridor. 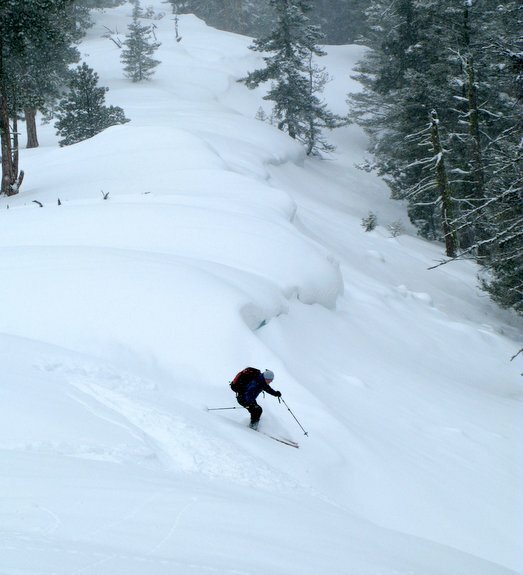 A variety of factors contribute to the area’s enormous avalanche flexibility. 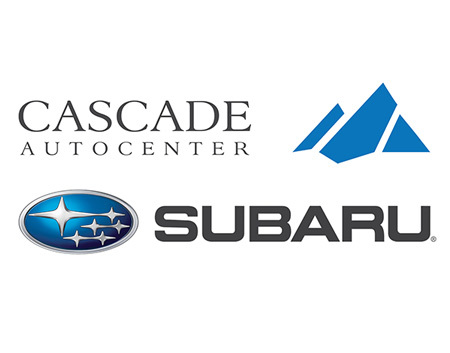 First, being some 30 miles east of the Cascade Crest, the hills and peaks flanking the Highway 97 receive far less snow than the crest — Blewett Pass itself typically receives about a third of the total snow Stevens Pass receives. Temperatures here are also considerably colder than along the Cascade Crest so the snow on the East Slopes sticks around longer, even at lower elevations. Finally the terrain flanking Highway 97 is simply friendly for winter travel – many of the exposures (south, east, and west) are not heavily vegetated and have nicely spaced trees, allowing cross-country travel. Thin forests also result in little deadfall, so not much snow is needed to convert hillsides into ski slopes or snowshoe routes. Finally most of the hills flanking the highway are not particularly rocky so, again, a little snow goes a long way in satisfying the needs of backcountry skiers, snowboarders, or snowshoers. 1) Storms that deliver 12 to 18 inches of snow along the Pacific Crest (and greatly acerbate the avalanche hazard there for a few days) only bring four to six inches of light snow on the highest peaks flanking Highway 97, which results in excellent powder skiing conditions with far less avalanche hazard than at the crest. 2) If the storms mentioned above are accompanied by strong winds (a frequent occasion, but an easy one to diagnose thanks to the weather telemetry sites), then the higher peaks like Diamond Head or Wedge Mountain are likely to have considerable lee depositions and slab hazard on the broad slopes and bowls with northern and northeastern exposures. Nonetheless, the many ridge systems touching the highway with western, southern, or eastern exposures are likely to have adequate snow to ski but be scoured enough to present little or no avalanche hazard. 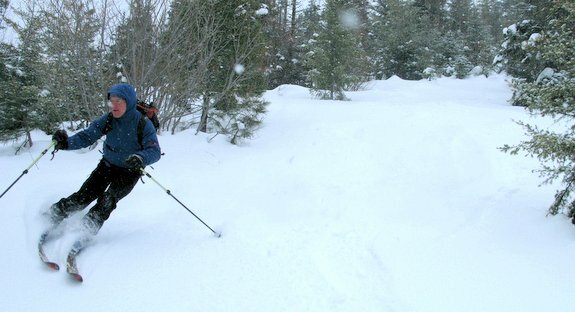 3) When frigid temperatures create temperature-gradient snow or surface-hoar conditions on the coldest slopes along the Highway 97 corridor (high slopes with northern exposures), the lower elevation terrain flanking the highway often has enough coverage to ski but not enough depth or complexity to create dangerous slab conditions. 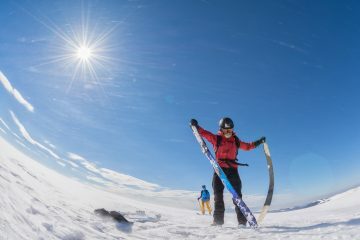 By combining all the safe ridges that are easily accessed from the highway with the ability to visit lower-elevation terrain with enough snow to ski but too little snow to avalanche, you can ski your heart out but not stick your neck out. All this was factored into the decision of where Tom Janisch and I skied in early March. It had been an unusual season with very little snow throughout November, December, and January. The higher elevation slopes that received some snow during this period saw that snow turn rotten down deep with the formation of temperature-gradient snow. The snowpack also developed big crystals of hoar frost on the surface. 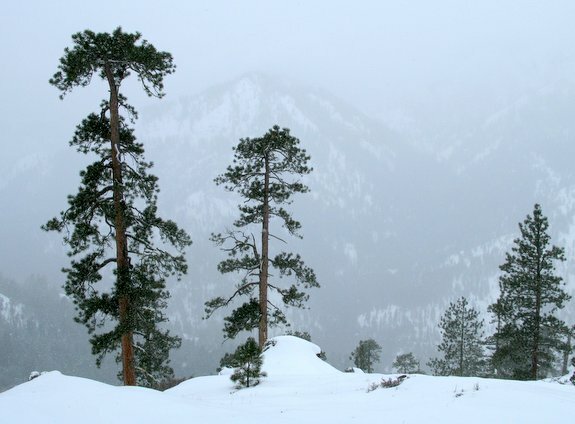 When February delivered near-record amounts of new snow, those high-elevation slopes turned dangerous thanks to the combination of rotten snow down deep and surface hoar on top. Lots of lower-elevation slopes also got covered by the February and these slopes lacked the underlying old snow creating dangerous conditions. 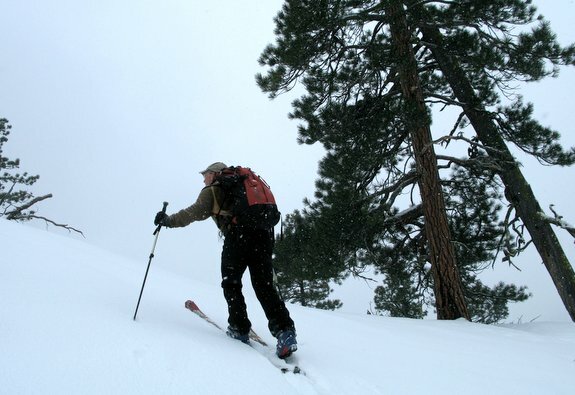 So we headed out with thoughts of skiing the low-elevation terrain near King Creek, along the Cardinal Points Tour, or near Old Blewett Pass. 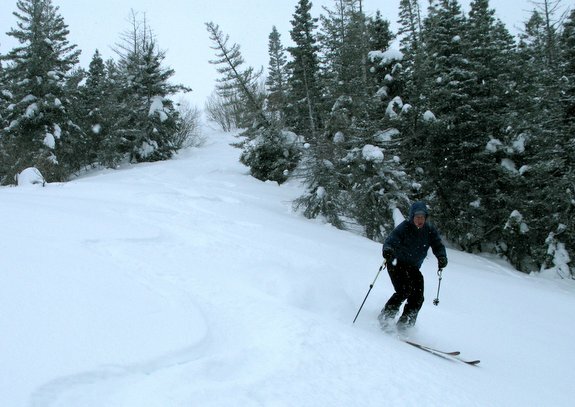 The order of the day, however, was to grab whatever low-elevation terrain first presented itself, and as we passed King Creek, the terrain north of Sheep Mountain offered just what we were looking for – enough new snow to ski, but not to slide. We parked at King Creek, walked the highway north for a quarter mile, and then started skiing upward. The route was initially steep but the snow, only a foot deep, was firm. You could throw dynamite on it and it would blow a crater in the ground rather than move the snowpack. Soon we were on a west facing ridge that climbed gradually, safely, and gracefully to a 4500-foot peaklet. From the summit we yo-yoed two different north-facing slopes covered, like an old lady’s cheeks, with fly away powder. These slopes had none of the worrisome deep snow being found nearby on the higher slopes of Diamond Head, Windy Knob, or Wedge Mountain because, until February, they were bare. Later in the day we returned to the car following the deposits of north-facing powder coating the lee side of the west-facing ridge we had used for the ascent. We would mine several powder turns down the fall line, traverse west toward the ridge, mine a few powder turns down the fall line, and traverse west again. Eventually we dropped of the ridge and skied the steep but firm west-facing slopes leading back to our starting point at the highway. Elevation Gain: (2,100 feet) to summit and back. Downhill laps add about 900 vertical feet each. Access. At the Y junction (intersection of highways 2 and 97) several miles east of Leavenworth, drive south on Highway 97 toward Blewett Pass. About 11.75 miles from the Y junction at Milepost 173, turn right into a small plowed area on the right. A sign on the left says King Creek. This is an easy trailhead to miss because the parking area is small and comes just after a curve. If you end up missing it and seeing the signs for Old Blewett Pass, you’ve gone too far (south) up the pass. Waypoint S1:47°24.619′ N, 120°39.478′ W. Elevation: 2,450 feet. Permits. No permits or parking passes are needed for this trip. Map. 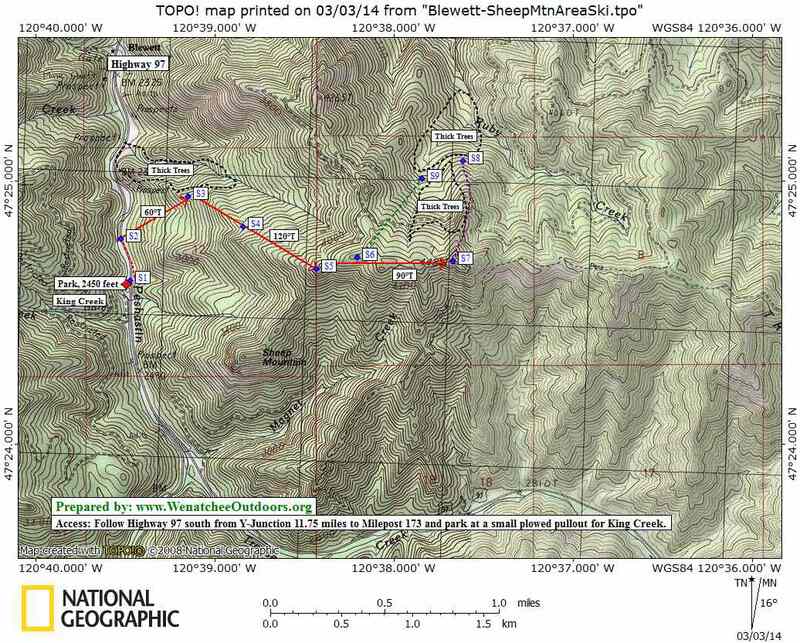 See our topo map of the route below. –Walk north along the highway 0.2 miles to Waypoint S2 (47°24.780′ N, 120°39.530′ W). 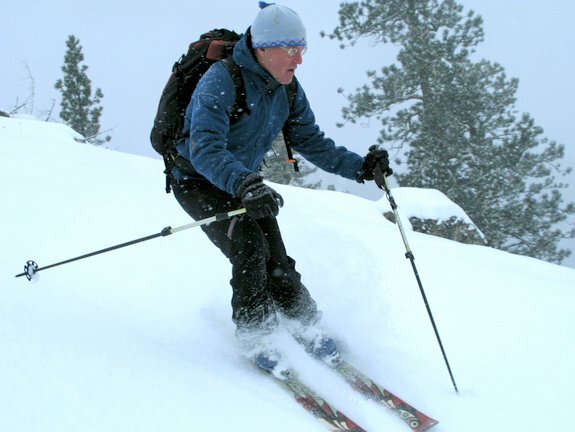 Ski up the west-facing slopes following a true bearing of 60 degrees to Waypoint S3 (47°24.942′ N, 120°39.155′ W at an elevation of 3,030 feet). –Follow a true bearing of 120 degrees to Waypoint S5 (47°24.666′ N, 120°38.439′ W at 4,235 feet). –Now head exactly east along the summit ridge for about half a mile to the highest point at Waypoint 7 (47°24.695′ N, 120°37.675′ W, elevation 4,485 feet). –Option 1 (Hard intermediate difficulty). Ski off the summit in a northerly direction toward Waypoint 8 (47°25.074′ N, 120°37.619′ W) staying on a ridge that is not always obvious. Trees on the ridge itself are sometimes thick but they’ll be much worse if you trend off the ridge by heading a few degrees too far to the east or west. Near Waypoint 8 you’ll hit an old logging road. Skin up here and climb up the ridge you descended or ski over to Waypoint 9 (47°25.009′ N, 120°37.848′ W) and then climb up to Waypoint 6 (47°24.710′ N, 120°38.210′ W). –Option 2 (Advance beginner difficulty). From Waypoint 6 (47°24.710′ N, 120°38.210′ W) ski downhill, following the best clearings visible, to Waypoint 9 (47°25.009′ N, 120°37.848′ W. We found this run to have lots of clearings that made for better sustained skiing than the intermediate route listed above. Snow conditions. Use our ‘Skiing’ Condition Reports to evaluate the snow and avalanche conditions before you head out. Also, check the Snow & Ski User Reports to see what others are reporting about the current backcountry conditions (you can find on the homepage). Post date. First posted March 3, 2014. Leave It Better than You Found It. This should be every user’s goal. Leave no garbage and pick up trash left by others.